There were many severe thunderstorm reports yesterday from northern Oklahoma east-northeastward to Ohio. The SPC outlooks were similar during the day - the 20Z product is shown at the top. The current plot of yesterday's reported severe thunderstorm events is shown at bottom. The north half of the slight risk area caught most of the severe reports, but the south half of this area was mostly devoid of storm reports. The moderate area outlooked at 20 UTC also remained mostly devoid of severe storm reports. A quick look indicates that most of the severe storms occurred along and north of the strong west-east frontal zone, with a large number of the storms being elevated and not rooted in the surface BL. The extreme eastward push of cT air - reported by Bosart on the MAPS chatboard - apparently lead to a rapid intensification of a capping layer above the BL across the south half of the outlooked severe area (the soundings taken at Little Rock, Arkansas, at 00, 03, and 06 UTC captured this capping process). The 500 mb S/W also took on a positive tilt during the day and slowed considerably, weakening forcing for vertical motion in the warm sector - thus, a missed short-term outlook worthy of more detailed examination. Looking north at Catalinas at sunset last evening (February 26th). Same view just after sunrise this morning (February 27th). Looking north from campus around 8 am this morning. When I got up this morning it was raining here at the house (a bit after 5 am) but but after 5:30 am it began snowing very lightly and now the precipitation has ended here (6:30 am). The front, and attendant precipitation band, moved eastward very rapidly. The four graphics above show the surface plot (NCAR RAP) around 2 am (all times MST) and regional radar about the same time. 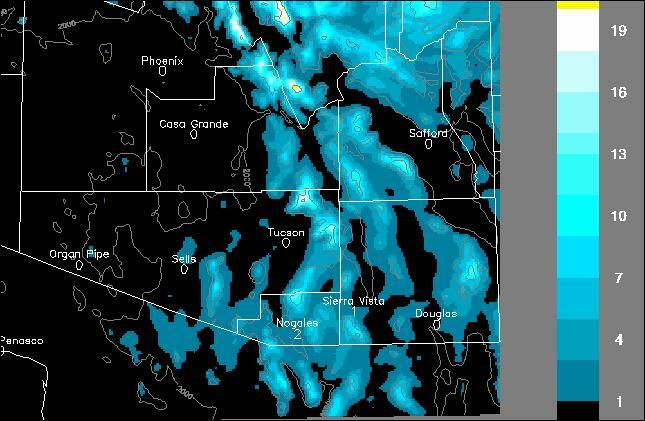 the bottom two graphics show the same for just before 6 am (note that bottom radar shows composite radar product from TUS - since the RAP radar products use base-scan data, their regional plot becomes a real mess due to blockage as the precipitation band moved into southeast Arizona, where coverage is only from TUS radar). Yesterday's WRF-GFS was within about about 2 hours of the frontal passage time (see early post below) at TUS (front moved by right around 3 am) and light snow began at the airport at 4:46 am. 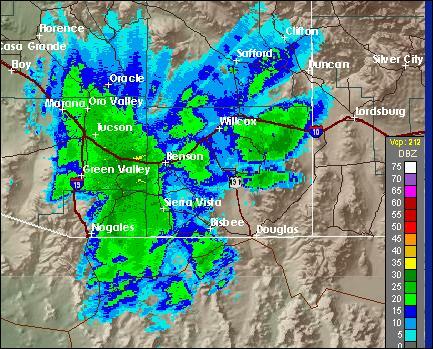 The lower surface chart shows that snow was occurring at Tucson, Nogales, and Ft. Huachuca at that time. At 6 am we had 0.24" in the gauge here and the eastern Pima County ALERT gauges indicate 100% coverage of precipitation. Amounts at 6 am were about 1/10 to 4/10s of an inch, with accurate readings not available where mostly, or all snow, fell. Temperatures across the metro area stayed just above freezing (again as forecast by yesterday's WRF) and there appears to be accumulations around the edges of the city, where elevations are a bit higher. I've shown above: 1) the GFS 144-hour 500 mb forecast valid at 00 UTC 27 February (5 pm MST last evening); 2) the GFS verifying analysis for 00 UTC last evening; 3 and 4) same products for the ECMWF. Again, the ECMWF was considerably better than the GFS with the long-rang forecast (6 days in this case). It should be noted that the GFS quickly became more and more similar to the ECMWF in subsequent forecast runs. The GFS was mostly off in location and orientation of the 500 mb trough over the West; whereas, the ECMWF was quite accurate regarding the position and orientation of the system, but was a tad too slow and also about 50 to 100 m too deep. But, once again, fairly remarkable performance, especially for ECMWF, for a six day forecast. Of course, the details of the sensible weather with the system are much more difficult and were still challenging to forecast within the last 48-hours. The U of A Atmo version of the WRF (WRF-GFS run at midnight last night) forecasts a very distinct and strong frontal passage across metro Tucson between midnight and 1 am Sunday morninig the 27th (top graphic). The total forecast model precipitation ending at noon Sunday (second graphic) indicates widespread precipitation with heaviest amounts at higher elevations (0.4" at TUS). Interestingly, the model forecast total snowfall by noon Sunday (third graphic) forecasts light snow across the Tucson metro - except here at house which is in the lowest elevations of metro area along the Rillito! The model forecast Tucson sounding for 3 am on Sunday (bottom graphic) shows a cold, saturated environment below a very low tropopause - note surface temp forecast of 33 or 34F. So, the WRF forecasts a very wild early morning here in Tucson, with the model forecasting the event locally (except in mountains) to have ended by midmorning. The cold, 500 mb low is now over land in northern California, northwest of Reno, Nevada, with coldest temperatures at its core a bit colder than -36C, according to the morning analyses - 12 UTC Saturday February 26, 2011. The satellite PW image for the east Pacific this morning (Friday February 24) indicates that the strong, short-wave trough off of Oregon and northern California coasts has managed to tap into the moisture plume north of Hawaii. Extent to which this moisture feed will continue during next 48-hours will be an important factor in determining the final QPF amounts from this storm. The models are all in agreement that this system will swing through Arizona Saturday afternoon into Sunday afternoon. Primary issues at this time: timing - models have been tending to slow down the system a bit. Most of the models do agree that the storm's main impact across southeast Arizona will occur between midnight and noon on Sunday. How cold will the 1000-500 mb thicknesses get as the 500 mb cold air moves by? Shown in middle two panels are: GFS operational forecast from midnight for noon Sunday with thickness in Tucson area of about 534 dm; this morning's NAM forecast (lower of two panels) for 5 am Sunday morning indicates similar thickness values moving toward the Tucson area. So, how low will the snow line come Sunday morning? I'd like to see values below 534 dm for flakes at the house - so it will be close. The bottom graphic is from the Atmo WRF-GFS midnight run. This model forecasts the snow accumulations (contours are in inches of snowfall) through Sunday to remain around the fringes of the Tucson metro area, i.e., about 3000 ft msl. Of note, the model forecasted snow in the Tortolitas, where the big golf tournament is underway. The model also forecasts a fairly significant snowfall across the southeast Arizona grasslands from Santa Cruz County and Nogales up toward Benson - will there be enough snowfall to ice over the highways (I know from experience that Highway 83 can become treacherous between I-10 and Sonoita)? Heaviest snowfall is predicted by the model to occur on the Catalinas and Rincons, where amounts approach 20 inches. We're now in the wait, watch, and observe mode as February 2011 brews up its second major winter storm. There was a very long, but quite thin, squall in the Southeast last evening and night. The top image shows the 0328 UTC radar mosaic (from the CoD page) with echoes of 50 dBZ or greater extending from western Kentucky southwestward to Louisiana. The middle image is from the NWS radar in northeast Mississippi (GWX) and shows a portion of the narrow squall line from a more detailed perspective, with stratiform precipitation trailing along quite a distance to the west. The length-to-width (or vice versa) aspect ratio of the radar squall line of strong storm echoes (>50 dBZ) is truly amazing. 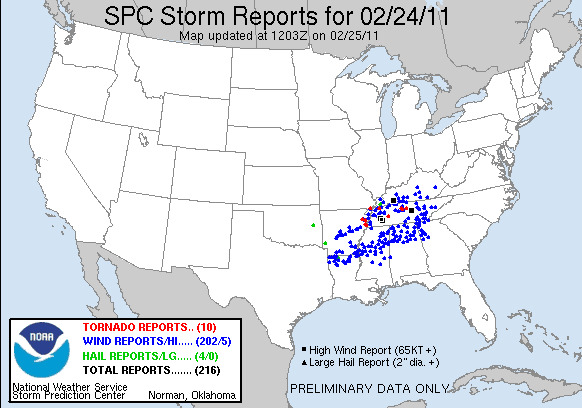 The bottom figure shows SPC severe thunderstorm and tornado reports from yesterday afternoon, evening and night. The preliminary reports indicate two, extended, nearly west-to-east swaths of severe reports with a long void between the swaths. It is interesting that the swaths of dense storm reports are oriented nearly orthogonal to that of the squall line. Interesting questions: if real, why the long gap from southwest Arkansas to eastern Kentucky without severe storms? When, if ever, will we be able to anticipate, on time frames of several hours to a day, such strange structures? As the 500 mb short-wave trough over New Mexico heads eastward and the strong, cold system over the Northwest digs south today, the country is nearly covered this morning with NWS watches and warnings and special weather statements! See above - range is from a severe thunderstorm watch (TX and OK) to a blizzard warning (ID and WA). The WRF-GFS run at Atmo at midnight, and the other forecast models, are forecasting gusty winds ahead of the Pacific Coast storm event. Above is WRF-GFS surface forecast for 4 pm Saturday afternoon. Looks like for second straight Saturday the air could be dirty with serious blowing dust and other sundry substances (see post for last Saturday morning down below). Also note above the warm temps with low dwpoints. Finally, the NWS GFS continues to be the most agressive of the models for the weekend storm across southeast Arizona. The GFS operational member forecast for noon (from 00 UTC run last evening) on Sunday is shown above. All 12 GFS ensemble members now forecast a nice precipitation event for Saturday night. The forecast thicknesses appear cold enough for some flakes here at house, and would likely bring a covering of white to the Dove Mountain course for the finals of the Match Play golf tournament! We''ll keep watching as this event unfolds. The forecast models have now been in reasonable agreement for several days (although the NAM seems to be holding with a different alignment of the west coast, short-wave at 500 mb) and indicate another very cold weather system will dig into the Southwest this weekend (500 mb temperatures within this developing wave were colder than -40C last evening over much of Alaska and northwestern Canada). Thus, it appears that February 2011 will exit just as it began, with unusually cold temperatures and perhaps a better chance of precipitation this time (snow right in town?). This event will likely garner more attention - the Tucson Rodeo is underway and runs through Sunday. The big dollar, PGA Match Play Championship comes to Dove Moutain just north of Tucson beginning this morning and running through Sunday afternoon. The most important matches are scheduled for the weekend, and there will be substantial national TV coverage of the event - could be quite interesting! The two graphics above compare the operational member 500 mb forecasts from last evening's ECMWF and GFS model runs. Note the runs are very similar and forecast 500 mb heights to fall below 540 dm over the Southwest by Saturday afternoon. The ECMWF is about 6 to 12 hours slower than the GFS, but both models are forecasting a very cold weather system across Arizona over the weekend. ﻿The two panels above show the operational GFS forecasts for midnight on Saturday night. Although the GFS height contours at 500 mb indicate a cutoff, the model winds indicate a strong open wave with excellent forcing for upward vertical motion. The operational member of the GFS forecasts 1000-500 mb thicknesses falling toward 528 dm during the Saturday night. If the thickness falls this low, with precipitation occurring (as the model forecast indicates), then the snow levels would drop right into metro Tucson. 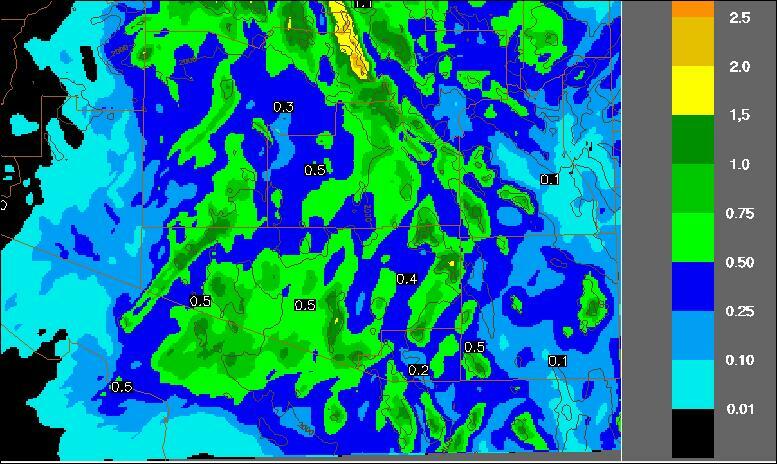 Note that all 12 GFS ensmble members forecast precipitation across southeast Arizona for the 12-hours ending Sunday morning at 5 am, and 9 of the members forecast precipitation for the 12-hours ending 5 pm Saturday afternoon. 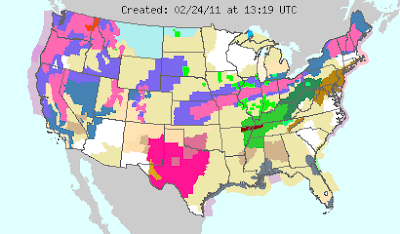 February 2011 could end up having record-setting storms twice during the month! Our visitors to Tucson (with expensive match play tickets) could leave shaking their heads, wondering why the PGA picked this cold locale for one of their biggest tournaments - keep tuned (matches will get lots of coverage on NBC). 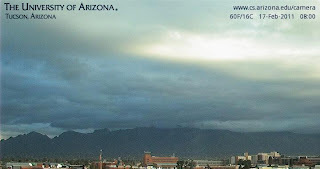 Light showers moved across the Tucson area late yesterday afternoon and evening. 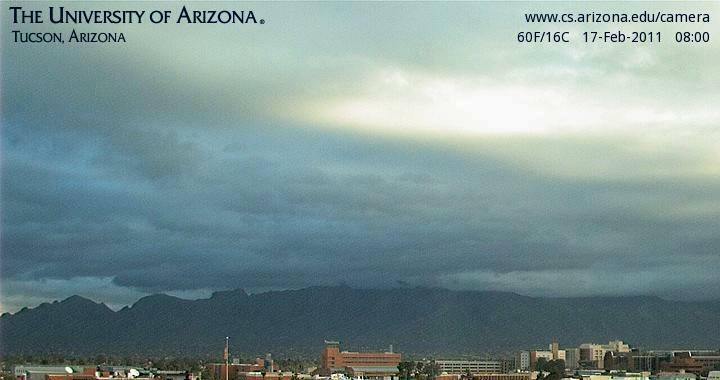 Above image shows light showers on the Catalinas and north part of town at 5 pm yesterday. 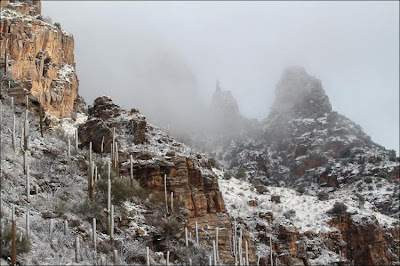 The very tail end of the weekend event left 30 of the 93 ALERT gauges in eastern Pima County with light precipitation, measured at 6 am for the past 24 hours (remember that the highest elevation stations may have had snow that was not recorded). Here at the house we had 0.04" between 5 and 7 pm. 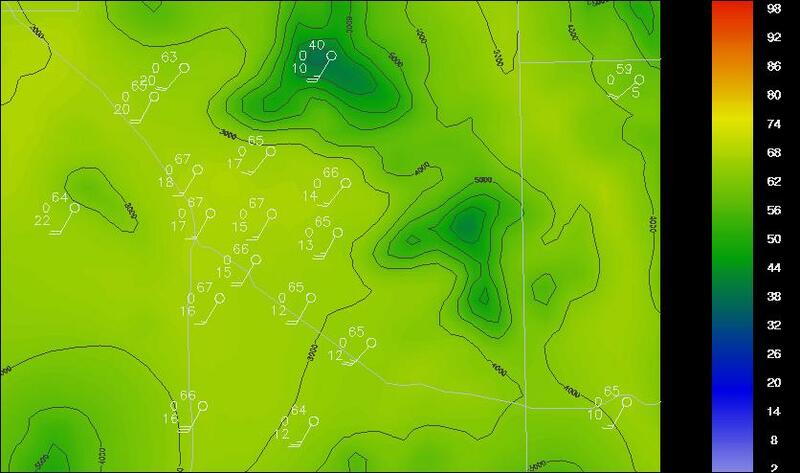 Six ALERT stations had 0.10" or more and highest amount was 0.31" up on the north slopes of the Catalinas. So, we now have a tiny bit of rainfall for February. Low temperature this morning at the house was 31F. The NAM 500 mb analysis at 12 UTC this morning (top chart) shows a trailing cutoff low off the Oregon coast. This feature is forecast by the model to drop rapidly southward over the Pacific and then to turn inland and weaken across Arizona and northern Mexico on Wednesday afternoon and night (60 hour forecast shown in bottom panel). At this time the models forecast some middle-level moisture and clouds to come across Arizona with this short wave, but only precipitation forecast is for northeastern portions of the state. The operational member forecasts for 500 mb (valid at 144 hours from last evening or 5 pm Saturday February 27th) are shown above for ECMWF (top) and GFS (middle). There is quite a bit of difference between the two forecasts. Both forecasts have cold heights (lower than 534 dm) over the western US but the ECMWF system is impacting the Southwest, while the GFS system is impacting the Northwest. Note that ECMWF forecast 500 mb heights are MORE than 300 m lower than those forecast by GFS near San Diego. The ECMWF has been doing much better than the GFS last several winters (my subjective feel is that at longer ranges for the western US it is more accurate for significant events than the GFS 8 or 9 times out of 10). So, something to watch as the week progresses. The bottom figure is the GFS spaghetti plots and ensenble average for 500 mb forecasts valid at the same time. In this situation the GFS operational member seems to be a significant outlier over western North America and the eastern Pacific, with many of the ensemble members having a forecast considerably more similar to that of the ECMWF (see the right panel). 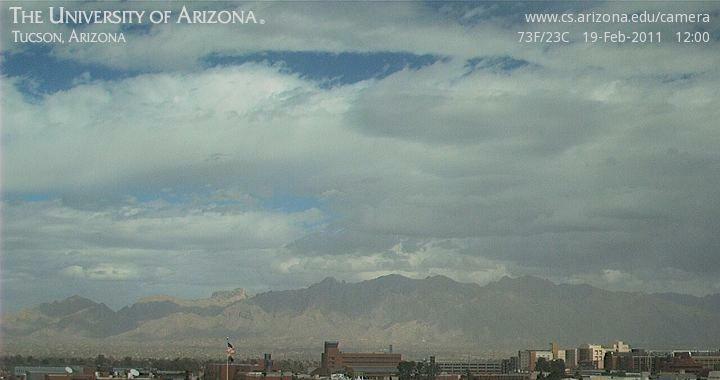 Weekend weather event has so far been mostly wind and dust across southeast Arizona. 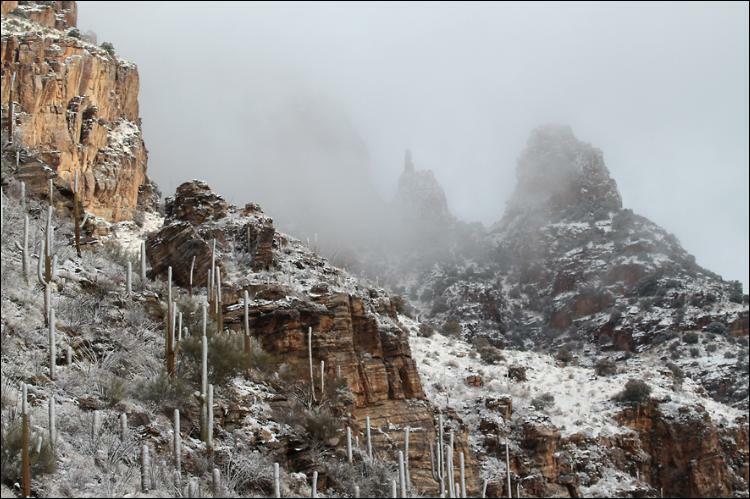 No precipitation recorded in the ALERT network at 6 pm yesterday evening, and only 8 stations in the Catalina mountains had recorded light precipitation by 6 am this morning (note that snow only might have occurred at some high elevations gauges). So POPs of 60% yesterday and last night were too high, as were the models' forecasts of precipitation coverage down here. However, the winds picked up and exceeded expectations with gusts of 40 to 50 mph common. Highest gusts I found were at Guthrie RAWS site with 70 mph - time series there seems to support this observation. Lots of ugly dust, as reported in previous post. Further north in the Phoenix area things were a bit more active. 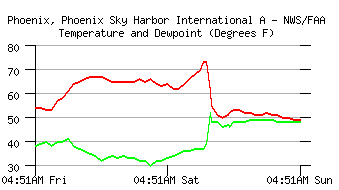 The above two graphics show time series of surface conditions at Sky Harbor Airport with strong frontal passage indicated around noon yesterday (Saturday February 19th). 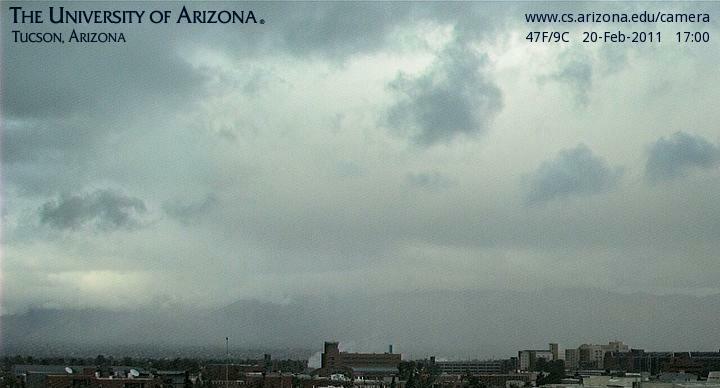 Showers with and behind the front produced 0.33" inches of rainfall at Sky Harbor. 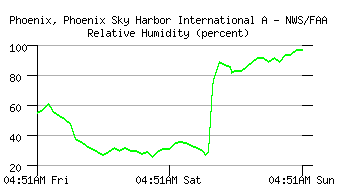 Winds have been gusting from the south-southwest since midmorning - some gusts over 45 mph at TUS. When I drove down to the south side to go to the main Post Office before noon, I could see large clouds of dust blowing off the tailing piles at the copper mines to the south toward Green Valley. 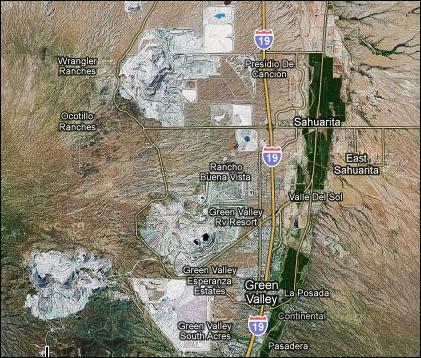 The densest of these were extending north to the Rincons and the east side of the Catalinas. Above two images show the dirty skies toward the Catalinas at noon, and an aerial view of the copper mines south-southwest of Tucson on the west side of I-19. I shudder to think of what all we might be breathing today! The large Pacific trough remains offshore west of California this morning. 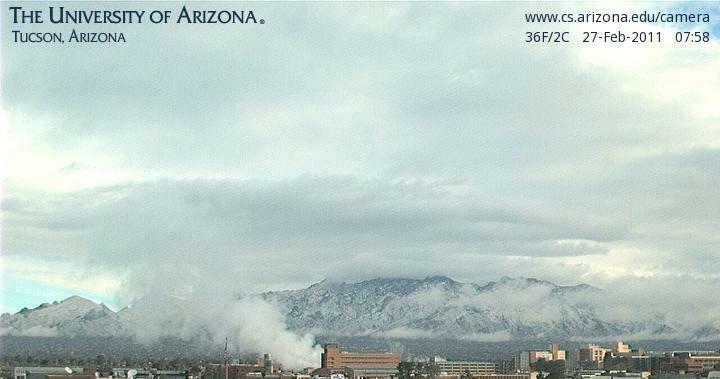 Rain and snow is falling over much of the northwest half of Arizona at sunrise and heavy rains and some thunderstorms continue in extreme southern California. Here in Tucson it is another mild morning - lows so far: airport 56F, Atmo 59F, here at house 48F. The top image shows middle cloud overhead and to the north. The second image shows eastern Pacific PW at 1200 UTC this morning (Saturday February 19th) and indicates that the Pacific trough has pulled a plume of higher PW back into the Southwest. So far not much to report from this part of the state. No precipitation measured across the eastern Pima County ALERT network during past 24 hours. I see that Kingman has had 0.72" of rain so far and that Flagstaff has had a sloppy mix of rain and snow that has totalled 0.70" so far. 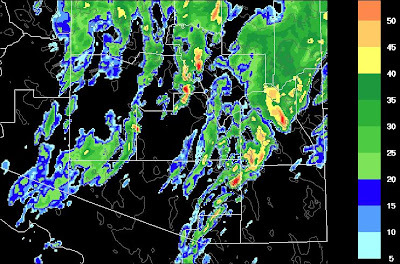 Models continue to forecast that this event will affect mostly the higher elevations of southeast Arizona with perhaps a tenth of an inch possible by 5 pm tomorrow afternoon in the Tucson area. The WRF-GFS midnight forecast for period ending at 5 pm on Sunday is shown in third panel, with most precipitation indicated over the Catalinas. 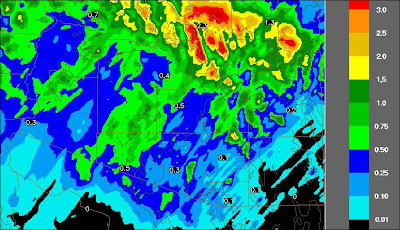 The WRF forecast of composite radar reflectivity at 5 pm today is shown in bottom panel. This indicates some deep convection and perhaps thunderstorms moving across the metro area this afternoon and evening - so some spots might get considerably more rainfall, as we did here at house with the brief storm at the end of January. The above is the NAM analysis of 500 mb heights and vorticity at 1200 UTC this morning - Friday, February 18th. The model analyzes numerous vorticity streamers and maxima within the west-coast trough eastward to the Great Lakes. The strongest maximum is analyzed far west of central California. The way that this feature moves into the bottom of the trough and then eastward will play a strong role in what happens here in southeastern Arizona. This morning the models continue to forecast that most precipitation, through Sunday, will be to the west and north of the Tucson area. However, both the NAM and this morning's early WRF now indicate QPFs in metro Tucson of about a tenth of an inch. Yesterday 2 ALERT gauges up in the Catalinas had very light precipitation, with no rainfall measured through the remainder of the network. Heavy clouds hanging on the Catalinas this morning Thursday 17 February 2011). Cloud cover during the night kept the morning low at a very mild 54F - the warmest morning low here at the house since last October or early November! Situation at 500 mb is very complex over the Pacific and western North America - GFS analysis at 1200 UTC is shown above. The sytem out near Hawaii has produced another long plume of high PW that curves eastward to northern Baja. What is not clear at this time is whether the short-wave trough/cutoff forecast to affect the Southwest this weekend will be able to pull this richer moisture northward. There is a massive 500 mb ridge extending northward across the Bering Sea and one stream of vorticity is digging south along the eastern side of the ridge, while several other vorticity maxima are along the west coast, having had their origins in the large, cold cyclone over Canada. It's not clear how well the models will do forecasting the details of the evolution of the current plethora of vorticity maxima - we'll have to watch as all this sorts itself out over the next couple of days. The two precitation forecasts above are from the midnight run of the Atmo WRF-GFS and and this morning's 12 UTC run of the NWS NAM model. The WRF (top) forecasts no precipitation in the metro Tucson area through 11 am Sunday morning, keeping the event confined higher elevations. The NAM (bottom) forecasts no precipitation over southeast Arizona through 5 pm Sunday afternoon, keeping the significant precipitation amounts over the Rim country and northwest mountains.